Laura Notario, Elisenda Alari-Pahissa, Almudena Albentosa, Magdalena Leiva, Guadalupe Sabio & Pilar Lauzurica. CD69 regulates lymphocyte egress from the thymus and lymph nodes through cis-interactions and the downregulation of surface sphingosine-1-phosphate (S1P) receptor-1 (S1P1). However, its role in the regulation of cell egress from bone marrow has not been extensively studied. mTOR pathway activation in bone marrow (Image: Magdalena Leiva). We show here that CD69 targeting induced rapid and massive mobilization of BM leukocytes, which was inhibited by desensitization to S1P with FTY720. 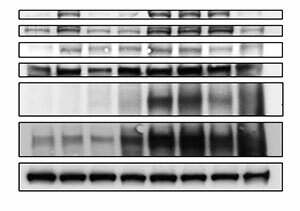 This mobilization was reproduced with anti-human CD69 mAb treatment of mice expressing human CD69. In this strain, the mobilization occurred to the same extent as that induced by AMD3100. The anti-human CD69 treatment highly increased LSK and CLP cell proliferation and numbers, both in the periphery and in the BM, and also augmented S1P1 and CXCR4 expression. Additionally, increased mTOR, p70S6K, S6, and 4E-BP1 phosphorylation was detected after in vivo anti-CD69 treatment in the bone marrow. Importantly, mTOR inhibition with rapamycin inhibited anti-huCD69-induced mobilization of hematopoietic stem and progenitor cells (HSPCs). Together, our results indicated that CD69 targeting induces not only mobilization but also high proliferation of HSPCs, and thus is crucial for precursor cell replenishment over time. These results suggest that anti-CD69 mAbs are putative novel candidates for mobilization strategies. Bárbara González-Terán, Juan Antonio López, Elena Rodríguez, Luis Leiva, Sara Martínez-Martínez, Juan Antonio Bernal, Luis Jesús Jiménez-Borreguero, Juan Miguel Redondo, Jesús Vazquez & Guadalupe Sabio. Here we show that cardiac activation of p38γ and p38δ increases during postnatal development and by hypertrophy-inducing stimuli. p38γ/δ promote cardiac hypertrophy by phosphorylating the mTORC1 and mTORC2 inhibitor DEPTOR, which leads to its degradation and mTOR activation. 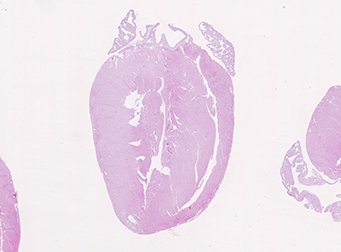 Hearts from mice lacking one or both kinases are below normal size, have high levels of DEPTOR, low activity of the mTOR pathway and reduced protein synthesis. The phenotype of p38γ/δ−/− mice is reverted by overactivation of mTOR with amino acids, shRNA-mediated knockdown of Deptor, or cardiomyocyte overexpression of active p38γ and p38δ. Moreover, in WT mice, heart weight is reduced by cardiac overexpression of DEPTOR. Our results demonstrate that p38γ/δ control heart growth by modulating mTOR pathway through DEPTOR phosphorylation and subsequent degradation.